Catching up on the great British bake off this afternoon inspired me to do a bit of Sunday afternoon baking. 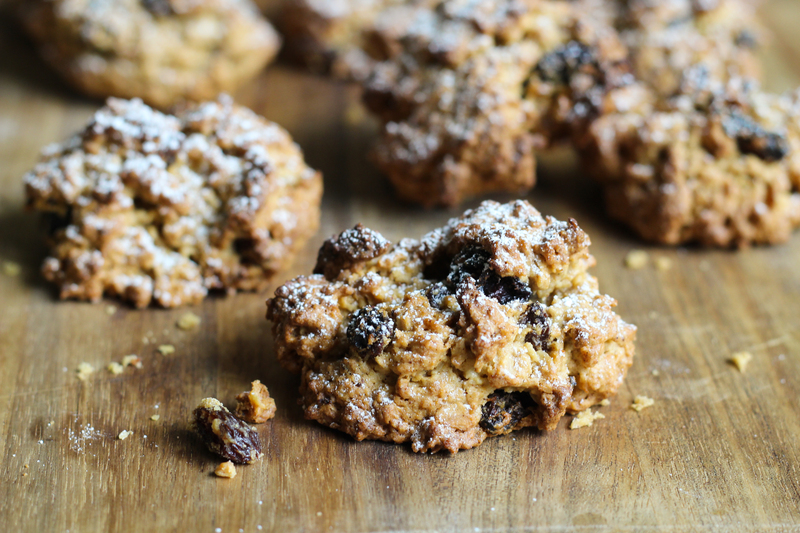 These rock cakes are super easy to make and are made with rapeseed oil instead of butter making them suitable for people on a dairy free diet. Gluten and dairy free oat and fruit rock cakes. a little icing sugar for dusting. Heat the oven to 180c and put non stick baking paper on two large square trays. Put the dried fruit mix in a small bowl and pour over 50ml of boiling water. Leave to stand for 20 minutes, then drain, saving the liquid. Mix together the oil and sugar, then slowly beat in the egg and reserved water from the dried fruit. Mix in the vanilla extract then sift in the flour, baking powder and cinnamon. Add a pinch of salt and stir in the oats and dried fruit mix. Spoon heaped tablespoons of the mix on to the trays, 9 per tray. Bake for 12-15 minutes until golden and crispy on top. Allow to cool and dust with icing sugar. Enjoy with a good cup of tea. I never would have thought I could have dairy free rock cakes. Thanks for sharing. Thanks. Give them a try, they are super easy to make.